A Texas organization devoted to ending animal euthanasia, a pastor who flies humanitarian aid to victims of disasters and a dog rescue organization in northern New Jersey are working together to rescue and find new homes for dogs displaced by Hurricane Harvey in Texas. The rescue organization, Home for Good of Berkeley Heights, N.J., is a partner of the Tess McIntyre Foundation. We have made a $1,000 donation to Home for Good this week to assist with this effort. One shipment of 25 dogs arrived in New Jersey earlier this month. A second shipment of the same number is expected in the coming weeks. The Saving Hope Foundation, the Texas organization, operates shelters in that state which were already at capacity when the hurricane hit. The initial shipment of dogs included those that were already in their shelters so they could make room for the animals displaced by Harvey. Saving Hope will care for those dogs until they can either reunite them with their owners or find new homes for them. The anticipated second group to make the trip north will be canine hurricane victims. The dogs are hitching a ride with Rev. Andrew Topp of the First Refomed Church of Boonton, N.J. Rev. Topp is the founder of International Humanitarian Aid. As with previous natural disasters, Topp flew supplies to the Houston area, including 300 pet gift boxes, donated by petgiftbox.com. He was accompanied by another New Jersey pilot, Tom Callahan. Volunteers from Home for Good made the trip with them and on the way back filled the planes with the homeless dogs. 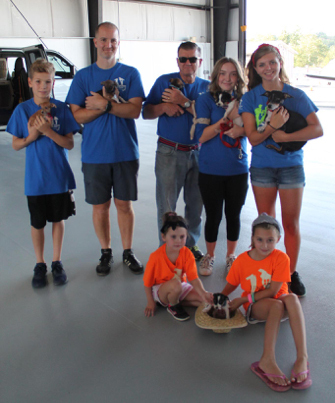 Upon their arrived in New Jersey, Home for Good placed the dogs with their volunteer foster families who will care for them until they can be adopted. Some of the dogs made a trip into New York to appear on the LIVE with Kelly & Ryan show. After that appearance, Liev Shreiber and Naomi Watts adopted two of the dogs. The Tess McIntyre Foundation raises funds to help rescued dogs. Working with reputable rescue organizations like Home for Good, we focus on aiding homeless dogs who need medical attention before the can be adopted. One hundred percent of your donations to the foundation goes toward helping these animals as we absorb all administrative costs ourselves.